Meghalaya Governor, Tathagata Roy, addresses the Special Convocation ceremony at USTM on Monday. GUWAHATI: The Meghalaya government has expressed satisfaction on the progress made by the University of Science and Technology, Meghalaya (USTM) to set up a super-specialty hospital and medical college on its campus at Baridua. Sources at the university said a plot for construction of the healthcare facility – PA Sangma International Medical College and Hospital – on the premises has already been finalised. 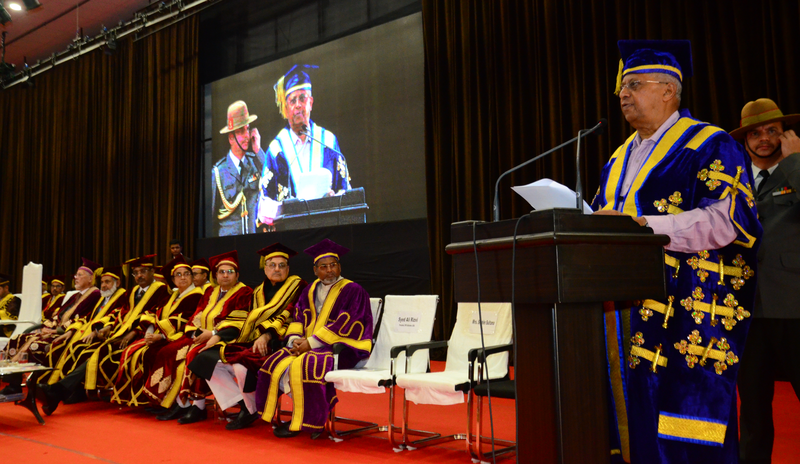 “The government of Meghalaya is happy that USTM is coming up with a super-specialty hospital and medical college,” education minister Lakhmen Rymbui said while addressing a special convocation ceremony to confer honorary degrees on visionary personalities at the central auditorium of USTM on Monday. Four internationally acclaimed personalities from fields ranging from education and entrepreneurship to industry and philanthropy received D. Litt. and D.Sc. degrees for their outstanding contribution to the society at large, from the university. The degrees were conferred by Meghalaya Governor, Tathagata Roy, in the presence Rymbui, USTM chancellor, Mahbubul Hoque, USTM vice chancellor P K Goswami, among others. The D.Sc. degree from USTM was conferred on US-based entrepreneur, philanthropist, author, civic leader, Frank Fakhrul Islam. The recipients of the D.Litt. degrees include, UAE-based entrepreneur and philanthropist, P A Ibrahim Haji, eminent educationist from Shillong and former UPSC chairman, Prof David R Syiemlieh and Singapore-based entrepreneur, Sudip Dutta. Rymbui praised the initiative of the university to honour the achievements of the personalities. Earlier, welcoming the dignitaries, USTM chancellor, Hoque expressed gratitude to the personalities for their magnanimous gesture to accept the honour conferred by USTM. The programme was presided over by the Meghalaya Governor while the convocation address was delivered by the education minister.